As multifunction devices proliferate, it seems that the selection of stand-alone scanners is shrinking. Often, though, the scanner components in all-in-one devices are not of the highest quality; they’re meant more for making copies than for digitizing your precious photographic memories. Not only are most incapable of performing high bit-depth scans, most also lack a means for scanning transparency media, like slides and film. 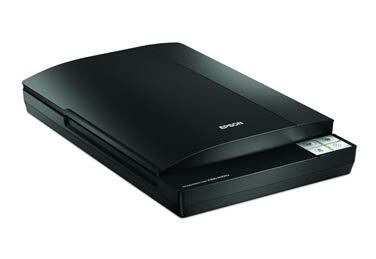 For those looking for a good quality photo scanner, Epson’s Perfection V300 Photo is an inexpensive flatbed scanner that can scan legal-sized documents, as well as 35 mm slides and film, at resolutions up to 4,800 dots per inch (dpi) at 48 bits. It connects to your Mac via USB 2.0 and has four shortcut buttons on the unit for scanning to e-mail, to PDF, to a printer, or to file. The included Epson Scan software is easy to use, offering many different modes, from full-auto to advanced, depending on the amount of control you want over your scan settings. The software includes tools to automatically restore color to faded photographs, which worked pretty well on a 45-year-old snapshot of my parents. Though the scanning software can be used on its own, we used Photoshop CS3 in our scanning tests. In those tests, with our Mac Pro 2.66GHz running OS X 10.5.4, we found the V300 to be a zippy performer, knocking out our 48-bit test scans in less time than many scanners in multifunction devices take for 16-bit scans. The scanner doesn’t require very much warm-up time either, which is nice. When we submitted the scanner’s output to a jury for image quality evaluation, the scans were given a Very Good rating, with scans of our picnic test photo showing plenty of detail and accurate colors. A scan of our grayscale resolution test chart showed that the V300 is capable of capturing very fine lines and details, reproducing tiny text very legibly. Even though the transparency scans are limited to a few 35mm slides or one filmstrip at a time, these scans were also of Very Good quality and the software has some handy tools built in for removing dust and film grain. Though its appeal is limited by its stand-alone nature, the Perfection V300 Photo, with its 4800 dpi optical scanning resolution and transparency scan support, is a good choice for those looking to take their snapshots, negatives, and slides into the digital age.